While some of us are lucky enough to have jobs that keep us moving/on our feet and allow for time to focus on working and eating healthy, many of us do not. The sad fact is that most Americans sit at a desk for at least 8-10 hours a day. What’s worse is that many of us also go home and continue to sit, whether it’s watching TV, sitting at the dinner table or even relaxing and reading a book. With family and personal obligations outside of work, it’s becoming increasingly difficult to fit in that workout or cook a healthy meal in our free time. Fortunately, there are ways to stay healthy during the workday. These recommendations will help you stay on track with your health and fitness goals, free up more time to relax when you get home and reduce stress levels before, during and after work. Take a break every hour. Set an alarm or timer on your phone for every hour you’re at your desk. You don’t have to go very far – the bathroom, kitchen, up and down a flight of stairs or around the building will suffice. Anything to get you on your feet and moving. 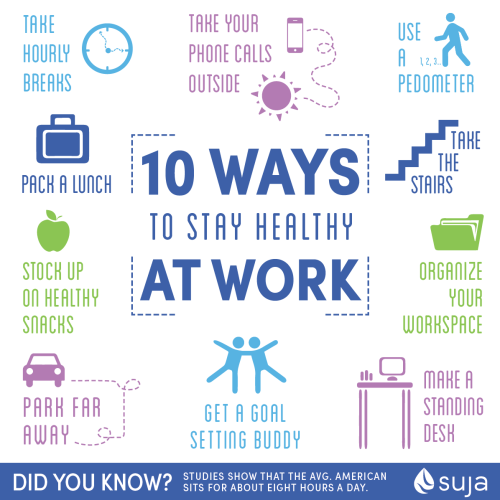 This is one of the most important ways to stay healthy at work. Take your phone calls and meetings with you. If you have a meeting scheduled with one person or are planning on having a phone conversation, take it outside! Walk around the building with your colleague or while you’re on the phone. Buy a pedometer. Studies show that we should all be walking at least 10,000 steps a day. Unfortunately, it’s nearly impossible to know what that looks or feels like unless you have a pedometer to help you out. This will help you stay on track and keep you motivated to hit your goal. Park far away. Sure, we all love the feeling of finding a parking spot close to the door but why not park in the spot furthest away? The walk to and from the building will add some steps to your 10,000 goal and help you clear your mind before arriving and leaving the office. Organize your workspace. Most of us usually have at least something to organize on any given day. Stand up, fix those papers, clean out that drawer and wipe down your desk. Not only will you add some movement to your day but your clean work area will help with productivity and stress as well. If you’re a neat freak, help someone else organize their space or clean those dishes left by your coworker in the kitchen. Treat escalators and elevators as the enemy. Take the stairs, they’re your friend! Normally with waiting for an elevator, waiting for everyone to exit and enter, taking the stairs actually doesn’t take that much longer. Walking up and down stairs are great for building strength in our legs and core. Fill your drawers with the good stuff. So often we make unhealthy choices at work because we don’t have any food or because we’re stocked with the bad stuff. Keep raw nuts, dried fruit, bags of kale chips, nut butter packets, apples, carrot slices, etc. in arms reach and you’ll be less inclined to eat that piece of cake your coworker is offering you. You’ll also be less hungry when lunchtime rolls around which will keep you from overeating unhealthy foods. Pack a lunch. When the office orders pizza or bagels, it’s hard to turn it down. However, if you come with a prepared lunch that you made at home, it’s easier to turn down those unhealthy options. A great tip is to cook more dinner than you need the night before and save some for lunch the next day. That way you don’t have to make an extra meal and lunch is a breeze! Get a buddy. Find someone in the office that has the same goals as you and keep each other accountable for eating healthier, taking hourly breaks, etc. You are more likely to succeed when you have someone there to support you and you’ll be less inclined to cheat. Feeling competitive? Make it a competition! stack them on your desk to hold your computer and keyboard. You know you’ve got the proper height when your arms form a 90-degree angle when typing. Anya is a natural foods industry vet, and was a key member of Suja’s marketing team from 2013-2015. Having struggled with dietary & digestive issues from a young age, Anya adopted a modified paleo diet during college and noticed a huge improvement in her overall health & well-being. She developed an immense passion for whole, unprocessed food and nutrition and is thrilled to be able to merge her passion with her professional career. Anya is a Certified Holistic Health Coach (CHHC) with a degree from the Institute for Integrative Nutrition. Check out her blog “Anya’s Eats”.